After reading the response to an email I sent to the lovely Christilynn of Inside Bella’s Closet, I figured I need to keep up with the posting here. So my next item I am featuring is not only one of my favorites, but it has a rather interesting back story. Here is the (in)famous Curious Gypsy thermal top Bella wears when Edward first speaks to her in biology class. I love this shirt for various reasons. 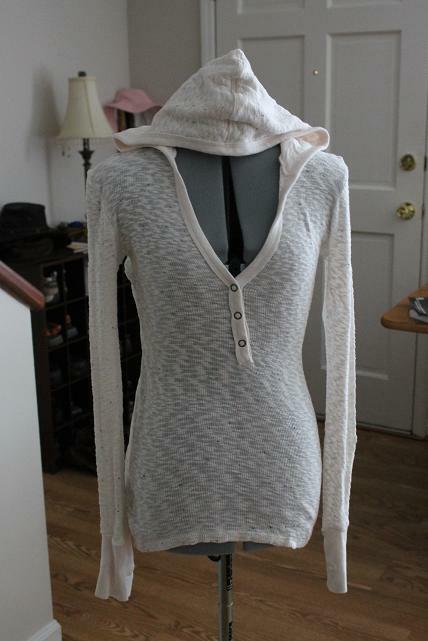 It’s light enough to wear all year round with a tank top underneath and various t-shirts and other tops over. I am in love with the thumb holes; I simply adore shirts with thumb holes. But, most of all, I got this shirt for free. You read that right. I paid $0 for this shirt that retails around $60 (when you don’t count eBay’s jacked up prices). Now, before I begin my little story, note that I absolutely cannot remember where I purchased this shirt. It was online through some retailer in California, San Fran I believe. They cater to college students and it is run by four very young gentlemen. I tried finding them again but I could not find their website, and they were pre-Facebook for me so I never liked their page. In any event, through some crazy amount of internet searching I found this website that was selling the actual Curious Gypsy thermal. They were hidden from the world since they only mentioned Twilight and Bella in their description and not the title of their item. I recall seeing their price was around $60 or so. I spent a long time debating the merits of owning a thermal shirt in that price range when JCP had thermals for $10 (and they had thumbholes too). Eventually I wanted the shirt too badly and bit the bullet, ordered one, and waited. Two weeks passed and I never received a shipping notice or an item. I emailed the company. I called them and got an answering machine. No response. I emailed again. I called again. Still no response. I gave up calling since they apparently didn’t keep the office hours they posted and continued to email. My emails went from civil to getting borderline PO’ed. After 5 weeks and 5 emails (mind you they said they respond to emails in 24 hours), I finally said “Forget it. Cancel my order and refund my money. And I’m never referring anyone to you ever.” That got their attention and they promptly canceled my order. I thought that was the end of it and lamented not getting my shirt but thought it wasn’t meant to be. Three weeks later I had completely forgotten the incident…only to come home to my mother going “You have a package.” Let me cut in briefly and say that between prop replicas, cosplaying, and knitting, I get a lot of packages. But I wasn’t expecting one this time so I opened it and out slips my shirt. Gobsmacked is the only way to describe my reaction, but then the adult kicks in and thinks “Did they charge me?” Because, seriously, that would be poetic justice that I get charged for a shirt two months after the fact. But they never have. And I now own probably one of the most sought after Bella Swan items and didn’t pay a cent for it. Awesomeness. Also, I would like to take this opportunity to say that every time I teach a mitosis lab, I giggle. Every. Time. It is one of my favorite scenes from the book (the movie lacks something I can’t quite put my finger one). Mitosis was also the subject I had to mock teach when interviewing for my job. I think that even if I leave the teaching profession, mitosis will follow me for the rest of my life. This entry was posted in Twilight and tagged bella swan, clothing, curious gypsy, twilight. Bookmark the permalink. Unfortunately, I will never be “getting rid” of any of my screen accurate items. I wear them all on a daily basis as part of my regular wardrobe. I can be hard on my clothes; no one needs to be buying my secondhand, ratty clothing.